Image caption "I worry terribly for the future of my family and families round the world"
A leading US Republican says she fears for the future of her seven grandchildren with Donald Trump in the White House. Christine Todd Whitman, head of the US Environmental Protection Agency (EPA) under George W Bush, accused Mr Trump of ignoring compelling science. And she warned that his threat to scrap climate protection policies puts the world's future at risk. Trump supporters say rules on climate and energy are stifling business. But Ms Todd Whitman says the US must find ways of promoting business without unduly harming the planet. Details of Mr Trump's climate policy are not yet clear, but his team have talked about boosting coal, opening new oil pipelines, and allowing mining on public wilderness or drilling in the Arctic. On the political side, they have suggested quitting the global climate deal, scrapping President Obama's clean power plan, and dismantling the US energy department along with the EPA itself. Ms Todd Whitman was interviewed on Trump's likely policies for a documentary - Climate Change: the Trump Card - which airs on BBC Radio 4 at 20:00 on Tuesday. She said: "I find it very worrisome that there seems to be a disdain for the science on protecting the environment. "I worry terribly for the future of my family and families round the world because Mother Nature has never observed geopolitical boundaries and what one country does really does affect another country. "To walk away from something where you have 97% of scientists saying this is occurring and people have an impact on it … it's gotten to the point where we've got to try to slow it down if we're going to survive it." She argued that Mr Trump was betraying a Republican heritage of conservation. George Bush Snr signed the UN Framework Convention in Rio in 1992. Abraham Lincoln, she remarked, was the first president to protect public land and Richard Nixon established the EPA. "Conservation is inherently conservative," she said. "I hope to be proven wrong by Mr Trump but you have so many multi-millionaires from the oil industry in his Cabinet. "We want to have power and be energy independent but the problem is doing it in a balanced way to protect health and the environment. But from Trump's view it doesn't seem to enter the equation." Mr Trump's picks for Cabinet posts have alarmed scientists. Several of them have cast doubt on climate science - although it is impossible to know exactly how they will act once in office. The nominee for Energy Secretary is former Texas governor Rick Perry, who has in the past argued for the abolition of the department he is about to lead. The choice for head of the EPA is Scott Pruitt, who wants to scrap the clean power programme which underpins America's pledge to the UN to curb CO2 emissions. Mr Trump's pick for Secretary of State is Rex Tillerson, head of oil giant Exxon Mobil, which is being investigated for allegedly misleading its shareholders over risks to the climate. Supporters say the EPA has been exceeding its powers and needs to be reined in. Nick Loris from the libertarian Heritage Foundation told BBC News: "Scott Pruitt has led the charge against an overly aggressive EPA - an agency that's run wild, rampantly, with excessive regulations that are devoid of any meaningful environmental benefit. "He wants to return environmental protection down to the state level where a lot of our environmental challenges can better be solved," he added. 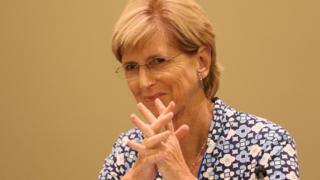 But Ms Todd Whitman said she hoped the new administration did not prove to be as extreme as it appeared at first sight. "Once he's in office, Pruitt will find it's a lot more complicated than they thought," she said. "Hopefully they'll be able to listen - and then start to moderate. "Regulation can go too far and there probably are regulations that have outlived their usefulness and need to be cut back to a degree… but to throw it all out…"
The impact of Mr Trump on global climate policy is hard to predict. Immediately after the election result, China, the EU, the UK and Germany - along with many developing nations - reaffirmed their determination to stick to the deal agreed in Paris last year to curb emissions. At home, it is thought unlikely that Mr Trump will be able to make good his promise to resurrect the US coal industry because investors have turned away from coal towards gas and ever-cheaper renewables. But if Mr Trump succeeds in making US energy prices even cheaper (some analysis suggests they are already down to Chinese levels), other nations may feel pressure to compete on energy cost from their own heavy industries. And when governments next meet to fulfil their promise of ratcheting up what they all agree is an inadequate climate policy, the absence of the USA at the table could prove very disruptive. But it's too soon to judge. China, for instance, may attempt to seize the moral high ground by stepping up its efforts to protect the climate - effectively taking over as world leader in the bid to protect the planet. That might not suit the future president.